Two-step heaven? Well, close to it; if the sound of a fiddle and a button accordion gets your blood racing then you owe it to yourself to let the Cajun Playboys (Peter Choates, Roscoe Theriot, Frank Barzas, Sammy Naquin, Kevin Dugas) come into your life. While there’s nothing blatantly ground-breaking going on here, the Playboys do sneak a little bit of country and early rock & roll flavor into their arrangements. It’s not overt, but it’s there, more in the way they attack their instruments than in anything else. It’s that subtle deviation from the norm that sets this group slightly apart from its peers. 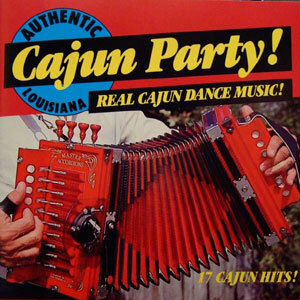 Still, if you’re looking for a good, solid Cajun music starter set you won’t go wrong with this. It’s a nicely varied program of originals and standards, with flavorful versions of a couple of country classics that at this point probably qualify for Honorary Cajun status. Released in 1995, 17 tracks.